The number of people who travel with their dogs is growing, and so too are the options for pets on the road. From “ruffing it” at campgrounds to enjoying fabulous four-star hotels, the time has never been better to pack up your pet and go. Talk to your veterinarian about medications that can help address issues like anxiety and vomiting. 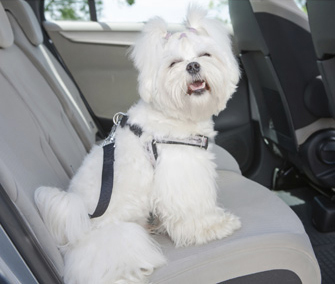 For some pets – the anxious ones — the medication may only be needed while your pet learns to become more comfortable in the car. For those pets with queasy tummies, anti-anxiety and anti-vomiting medication may always be needed when traveling. Your veterinarian can also advise you if medication is not the best option for your dog. And make sure your pet has an ID tag with your cell phone number on it. Even better: An ID tag and a microchip — and make sure your pet’s chip is registered and the information is current.